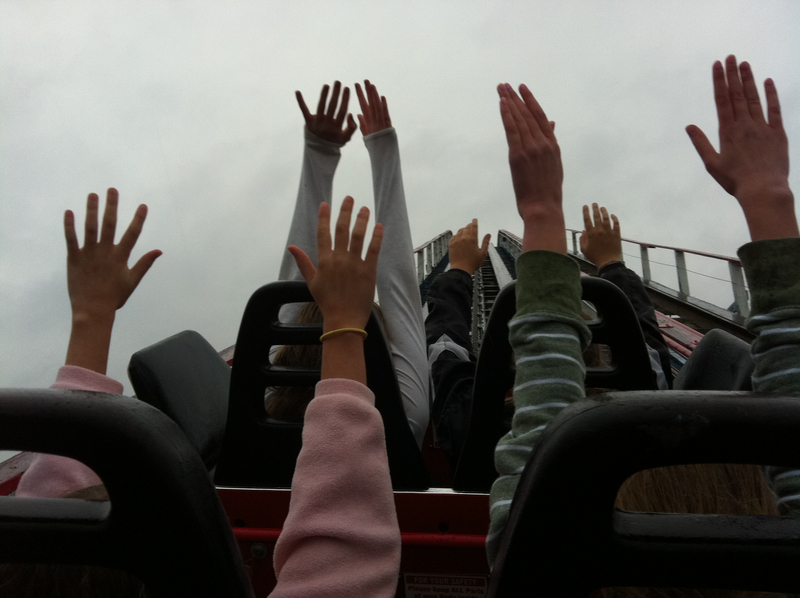 Last Sunday my daughters and two of their friends spent a fun, but rainy day at Six Flags Great America in Gurnee. The amusement park was closed for Deloitte’s Friends and Family Day, and even the rain couldn’t keep me and the mom that I was with from giving our girls the chance to experience big roller coasters with shorter-than-normal lines. “We’ll stay as long as you want,” I told the girls as they raced to their first ride. Eight hours later, we were taking one last rain-pelting turn on the Raging Bull before heading to the van. Everyone was chilled to the bone but, surprisingly, no one complained. We had made the most of this opportunity we had been given, and no amount of shivering could take our sense of satisfaction away. Especially mine. In the weeks leading up to the event, I’d had several chances to back out of taking the girls to Six Flags. Like when my husband and I learned that the NASCAR race in Joliet was scheduled for the same day. And when our small group announced that the first meeting of the year would be held while we were at the theme park. Some might see these conflicts as reasons to put off going until next year, but I couldn’t do that to the girls. Being a person of our word matters. So much so that years ago I made up a rhyme to remind my daughters to always do what they said they would do because God rewards those who follow through. Great things like breaking our record for the number of thrill rides ridden in a single day (which now stands at twenty). And the look on my face when I learned that the American Eagle car I had just buckled into was about to travel … backwards. Life is a lot like that wooden roller coaster every time it threatens to take us in directions we never intended to go. Whenever this happens, it helps to remember that what some see as a reason to hop off, could also be a reminder to hold on and get ready to enjoy the ride.